A number of Chinese tourists are cancelling trips to South Korea in the wake of the country's decision to deploy a missile defense system, a trend which experts say might lead to a blow to South Korea's tourism industry if it continues, as the sector depends heavily on visitors from China. A Beijing while-collar worker surnamed Wang who planned to travel to South Korea in August told the Global Times that although she has already placed a non-refundable payment on a hotel, she was cancelling because of THAAD. "After all, there are still a number of travel destinations where I can go," Wang said. Travel agencies in China and South Korea have also noticed the trend. Xu Xiaolei, manager of marketing at China's CYTS Tours Holding Co, said that there have been a handful of clients who cancelled their bookings on a South Korea tour recently. "Also, compared with last year, the recruitment process for tours to South Korea during the Golden Week three-day holiday has been slow." Xu told the Global Times on Monday. South Korean tourism industry officials, along with officials from travel agencies that specialize in hosting Chinese tourists in the country, have said that there are "a rising number of Chinese tourists cancelling reservations for August," according to report on koreabizwire.com. The most recent cancellation was for the Chimaek festival, an annual celebration of fried chicken and beer that began on July 27 in Daegu, a city in southeastern South Korea. To attract Chinese tourists, the committee came up with a scheduled program in May and organized a train for incoming tourists from Seoul to Daegu, Korea JoongAng Daily reported on July 25. The number of Chinese tourists who signed up for the organized tour was 500 by early July, the report noted. But in the two weeks since South Korea announced the deployment of the Terminal High Altitude Area Defense (THAAD) anti-missile system, which has received intense backlash among the Chinese public, over 60 percent of the bookings have been cancelled, said the report. As a result, the committee has decided to offer a sightseeing bus instead of the originally planned train. Several days ago, Daegu's 23-year-old sister city in China, Qingdao, East China's Shandong Province, said it would not be participating in the festival due to "inappropriate timing," the report noted, citing a Daegu city official. The Qingdao government also called off plans for a Daegu government exchange visit to the Qingdao Beer Festival, which started on July 29, amid public outcry to boycott South Korean products, the official said. Recent years have witnessed a soaring number of Chinese tourists visiting South Korea. The number of Chinese arrivals grew 29.4 percent year-on-year to 3.82 million in the first six months of 2016, accounting for 48.8 percent of the country's foreign visitors, the Korea Tourism Organization data showed. 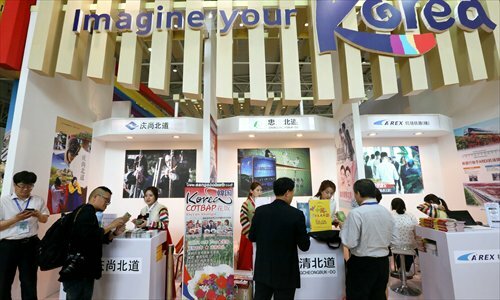 Wei Changren, CEO of Beijing-based Jinlu Consulting, told the Global Times on Monday that South Korea's tourism and travel retail sector rely heavily on visitors from China. In the first half of 2016, an estimated 65 percent of the sales volume of Samsung Group's Shilla Hotel and Resort, the country's second largest duty free shop, was generated by Chinese visitors, up 45 percentage points over the same period last year, according to koreabizwire.com. "About 70 percent of Chinese tourists travel to South Korea to shop. But average spending by Chinese tourists has decreased recently," Zhu Zhengyu, an industry analyst with Enfodesk told the Global Times on Monday. "If the number of Chinese visitors continues to drop, the retail industry in South Korea will suffer." Zhu's opinion is echoed in a report published by Samsung Securities, which reveals that if the number of Chinese visitors shrinks by 1 percent, the operating profit of Shilla Hotel and Resort could fall by 2.6 percent. "Besides, considering the size of China's economy and population, no other country can fill the vacancy if Chinese visitors go away," Zhu said.